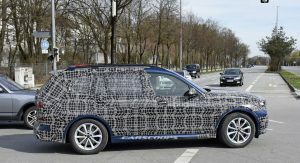 Remember the BMW X7 iPerformance concept that made its public appearance at the Frankfurt Motor Show last year? 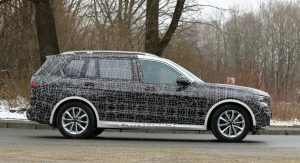 It previewed the German-manufacturer’s upcoming 7-seat flagship, which will battle against the likes of Mercedes-Benz’s GLS. 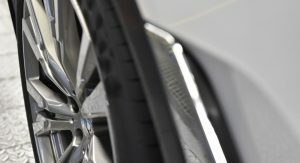 Now, if you liked its controversial styling, the good news is that it’s due for an official reveal later this year. But who can be bothered waiting? We’ve illustrated the real thing in all its spyshot-based glory, so let’s delve further. 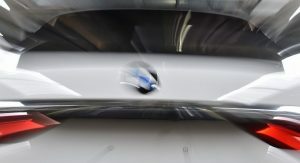 One of the concept’s most jarring design aspects was its huge, beaver-faced grille. 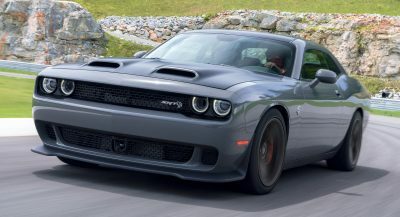 Controversially, this will carry over for production and will no doubt cause a stir – but it’s not all that bad. 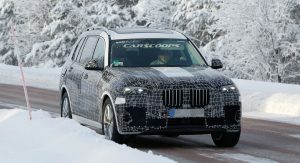 The X7 (codenamed G07) carries many other elements from the concept too; these range from diagonal fender vents, a chrome strip running along the lower doors, imposing front intakes, slim Laserlight headlamps and a chiseled hood. 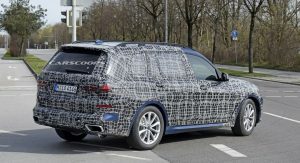 Viewing it from the rear is far less polarizing, with styling that’s similar to BMW’s current lineup. 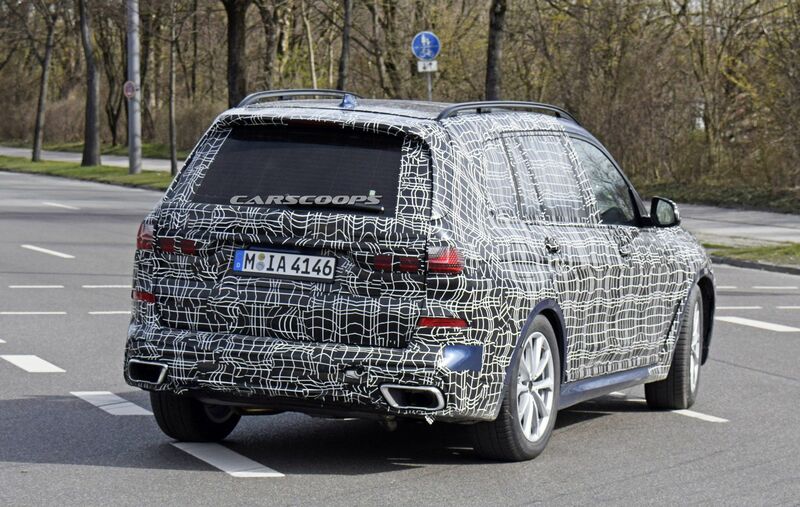 Here we can see LED tail lamps, an horizontal chrome strip, split tailgate and dual exhausts. 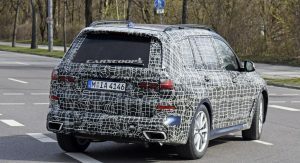 As BMW’s flagship SUV, the X7 will come loaded with all the technology features we’ve seen in models like the 7-Series limousine and then some more. 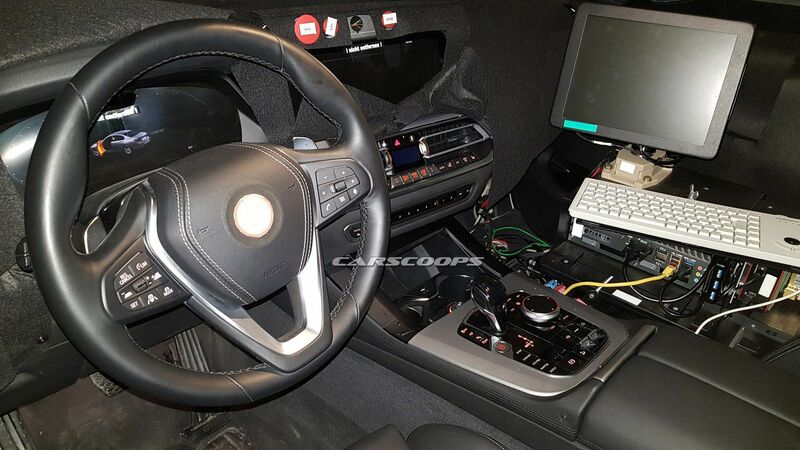 Our spy pictures of a prototype’s interior reveals BMW’s new fully digital instrument cluster. 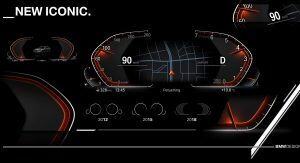 In the official teasers released by BMW earlier this month, we see it will include a large central area that can be used to show navigation data flanked by a fuel gauge and speedometer on the left and a tachometer and temperature gauge on the right. 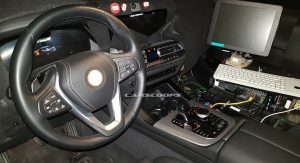 The tester we spied had the same three-spoke leather-wrapped steering wheel we’ve seen on the latest 5- and 7-Series sedans, along with metallic accents and an assortment of controls around the newly-designed gear selector. 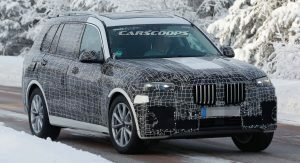 As with other upcoming BMW models, the X7 will get a new layout on the center console boasting a small digital screen controlled by toggle switches for the air-conditioning system placed between the air-vents. 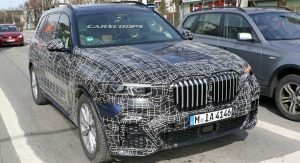 The X7 will be, if not the first, one of the first BMWs to get its next-generation infotainment system blandly named ‘BMW Operating System 7.0’. 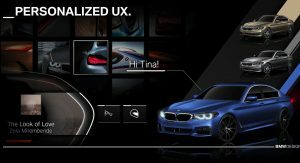 It promises to offer a clearer layout and structure as well as more intuitive operation that will allow users more customization options on the ten menu pages. The Germans claim that it will show the information you want when you need it. For example, it will switch to a parking map when you approach your destination. 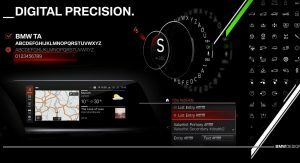 Users will be able to operate the infotainment system through the brand’s familiar iDrive controller as well as through the touchscreen display, and via voice and gesture controls. 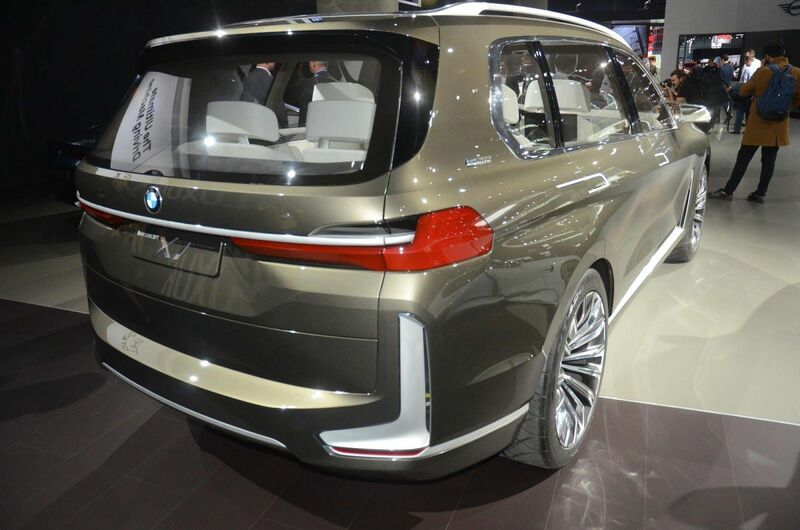 BMW’s justification for the X7 is to offer something bigger than the X5, with room for seven occupants in comfort. 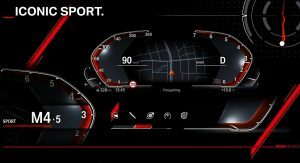 For reference, the X7 iPerformance concept measures around 5,020mm (197.7 in.) 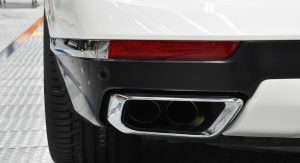 in length, 2,020mm (79.5 in) wide and 1,800mm (70.9 in.) 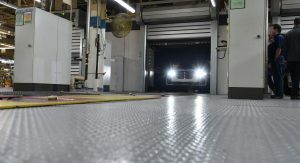 high, with an wheelbase of 3,010mm (118.5 in.) 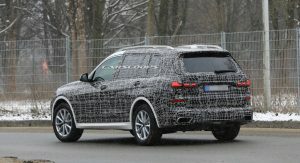 – which makes it slightly shorter, yet wider than an Mercedes-Benz GLS. 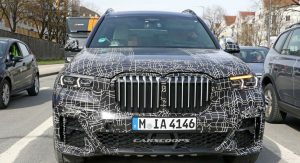 The X7 will essentially be an CLAR platform-based, high-riding 7-Series with features like ambient lighting, Bowers & Wilkins audio, night vision with object recognition, BMW gesture and voice control, BMW display key (in which selected functions can be controlled via remote) and adaptive driving modes. 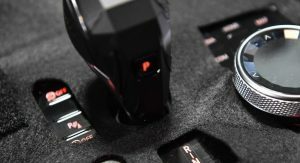 Optional rear-seat entertainment; including 10” color displays, connectivity for mobile devices & gaming consoles, are among some of the many other features set to appear on the X7. 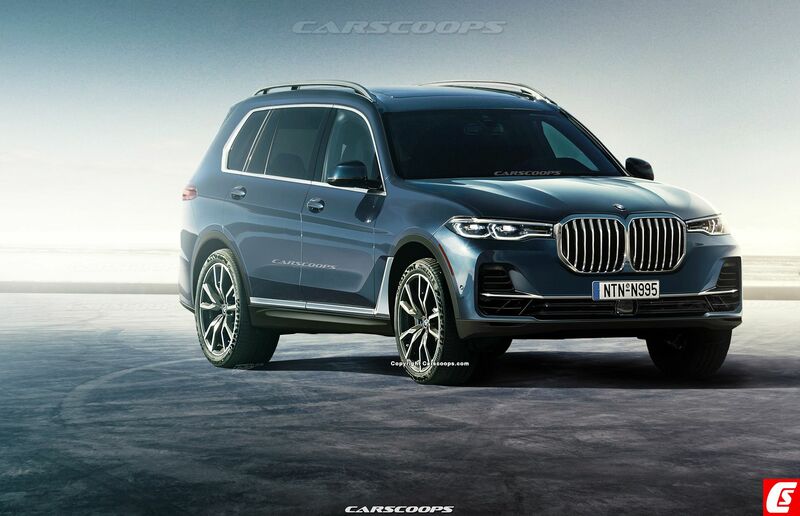 Besides the regular 7-seater family hauler, BMW executives have hinted at the creation of a range-topper version with individual seating and increased space and luxury amenities for four passengers. 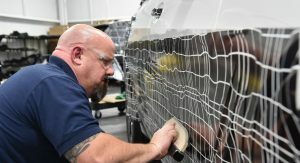 This model will be primarily aimed at the U.S. and China with company officials saying it will definitely cost more than $100,000 but will not top the $200,000 mark even when fully equipped. 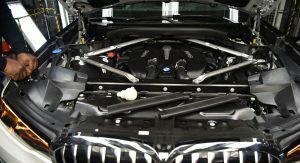 Powertrain options are expected to be a mix of BMW TwinPower Turbo gasoline and diesel engines, in six and eight cylinder configurations. 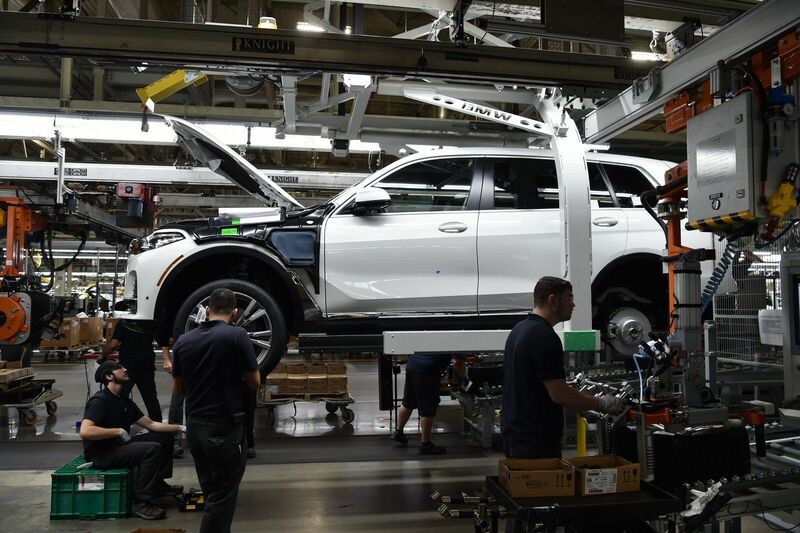 The U.S. should get a 3.0-liter TwinPower Turbo six-cylinder with 335 hp (250 kW) at launch serving as the entry-level model. 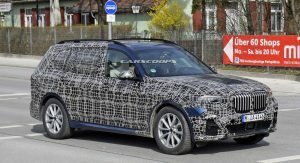 According to a leaked spec-sheet from last year, BMW will compliment the straight-six with a 4.4-liter TwinPower Turbo V8 developing 455 hp (340kW) on the xDrive50i. 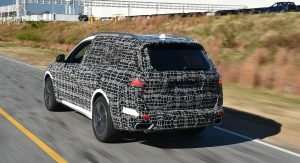 That leaves room for an over-the top X7 xDrive M60i with the M760Li’s monstrous 600PS (592 HP) and 800Nm (590 lb-ft) twin-turbocharged V12 to further differentiate the model from the next X5, despite some rumors claiming that BMW could pull the plug on the 6.6-liter engine down the road. 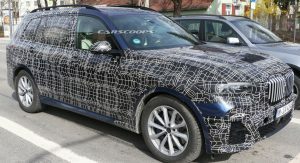 Europe could potentially get the M550d xDrive’s 395hp (400PS) tri-turbocharged 3.0-liter straight-six diesel too, offered next to a tamer xDrive40d model with a twin-turbo six 3.0-liter diesel delivering just above 300 horses. 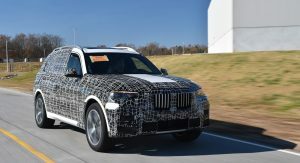 One thing we can be sure about is the addition of an X7 iPerformance model, in all likelihood, with a four-cylinder gasoline-electric plug-in hybrid powertrain. 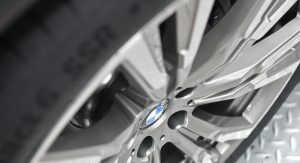 Power will be put to the ground via BMW’s xDrive all-wheel-drive system and an 8-Speed transmission, designed with BMW’s EfficientDynamics ethos in mind. 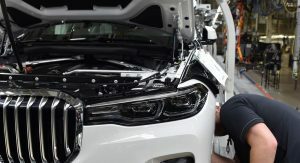 The latter combines technologies like Automatic Start/Stop function, Brake Energy Regeneration and electric power steering to help improve fuel efficiency. 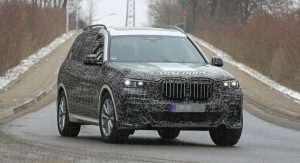 Asides from the Mercedes-Benz GLS, the X7 will also go toe to toe with other large luxury SUV’s such as Audi’s Q7, Bentley Bentayga, Range Rover, Lincoln Navigator and Cadillac Escalade. How long until I see it in showrooms? 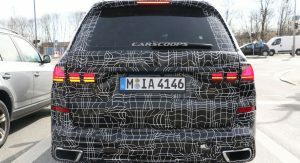 Expect an official reveal at the Los Angeles motor show this November, with sales starting in early 2019. 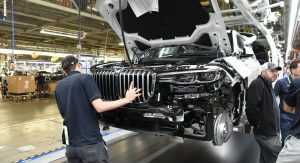 The new X7 will be built at the company’s plant at Spartanburg alongside BMW’s other crossovers. 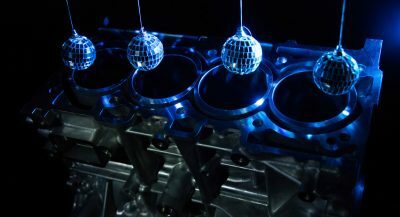 Big high horsepower eninges…with too many moving parts…and crushing out-of-warranty-upkeep costs don’t turn me on anymore. ..exactly what the government wants. This render looks a little flat especially on the side where the doors are at. Like the highlights are not detailed which makes it look slab sided in my opinion. Now I can’t render anything but that’s my take away from this render. 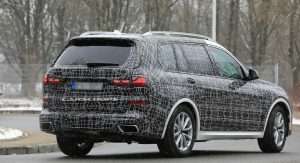 No surprise here, looks like a larger X5. 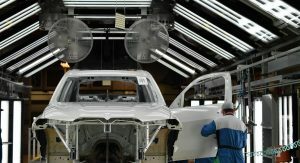 Not offensive, so they will sell (lease) a lot of these here in the US, and will be a huge moneymaker. I would take a Lincoln Navigator or Aviator over this any day. Looks like an elegant minivan. 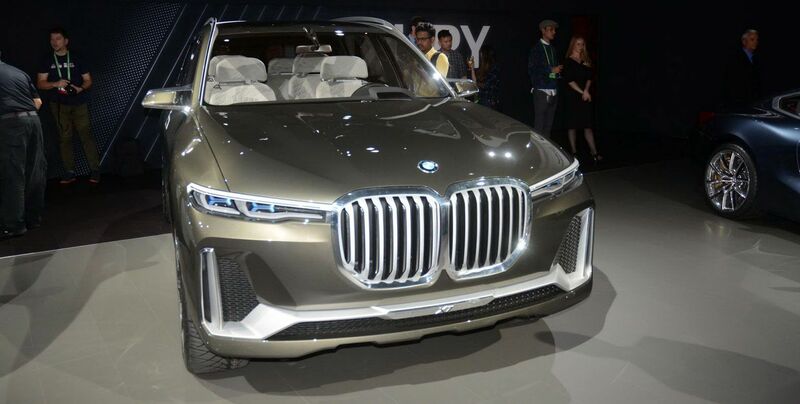 The grille resembles those ginormous watches insecure old men need to wear to attract the young ladies. This has depreciation disaster written all over it! 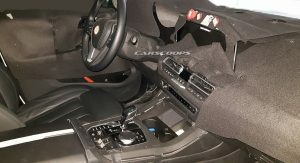 Seems like BMW gave up on making nice interior. I know these are camo and covered, but the gist of basic design and materials are coming through and they don’t look promising. 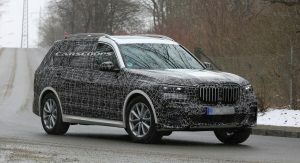 Absolutely the BMW I have always wanted them to make. Who needs an Ultimate Driving Machine? This is a real BMW right here. Yes. I randomly bash on keyboards and hope nothing sarcastic is typed up. it’ll sell because it’s a BMW. But it’s not all that good looking. 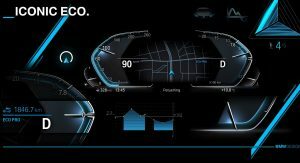 I think BMW’s design language is a bit stale. I like how Mercedes comes up with fresh designs every decade. And I think Audi’s are more handsome looking. 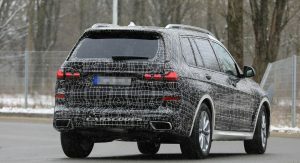 As for the top model, I can understand the similarity with the 7 series by giving it an M60i V12 version. 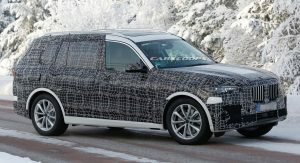 But as we know the Rolls-Royce Cullinan is coming exclusively in V12 that would make more sens to give to the X7 an M version with the M5’s and M8’s V8. Rolls Royce is not an excuse to keep BMW down. Wow! Wow! Omg!! That is astonishingly UGLY!! Not the sexiest thing on the road. But it’ll sell to people who gave up on their Range Rovers. looks like a schoolbus, yuck! 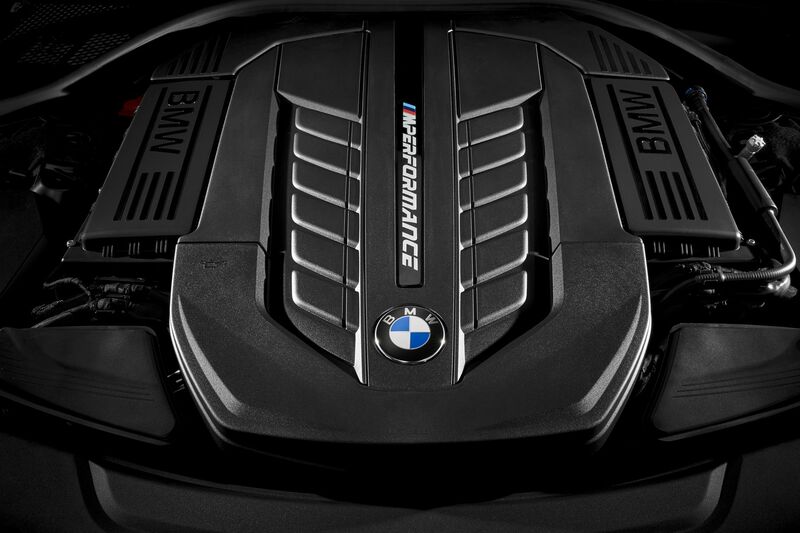 Don’t skimp on the V12, what reason that a sedan/coupe can have one but not an SUV? Ugly. But will see plenty on the roads. See too many Bentaygas for my liking, so there is a market for this travesty..